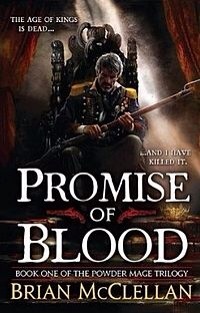 Brian McClellan’s Promise of Blood is epic in every sense of the word. It’s a heroic adventure at its brilliant best but it’s also a full blown awesome fantasy. Deriving his world and building it from the idea of the Napoleonic age, McClellan has mixed ancient sorcery and emerging industry, magic and gun powder, gods and guns. Think Sharpe with magic. The concept is inspired and the story does it more than justice. We’re introduced to Adro, one of the Nine kingdoms in this world, and Field Marshall Tamas just as he completes a bloody plot to overthrow a corrupt King and a bloated nobility. This coup is the catalyst for entire plot of the novel but it also reveals one of a number of dichotomies at work in the book. Whilst the first concerns the clash between royalty and society the second looks at the sense of loyalty between family and country which occurs for a few of the main actors, especially Tamas. He also features in the clash between magic and sorcery. Tamas is a Powder Mage; he has the power to control gun powder, use it to enhance his senses and give him superhuman strength. On the other side of this is the Privileged; sorcerers who can tap into an ancient power, cast spells and manipulate huge forces. Prior to his execution, the King of Adro had frittered away his nation’s wealth and while the people starved, he aimed to sell his country to the neighbouring Kez. Tamas won’t stand for it but the results of his coup are far reaching. The Kez made Tamas an enemy when they beheaded his wife for spying; now that hatred is once more burning as they attempt to invade the weakened Adro. However, having killed the royal cabal of Privileged, Tamas has unleashed an ancient sorcery that will bring down the wrath of a god. A god that most people think is myth or mere religious dogma. Entwined in all this is Adamat, a semi-retired investigator, employed by Tamas to uncover the truth behind the Privileged’s mysterious messages. He is a great foil for the author to discover the city and it’s inhabitants from the high borne to those dwelling in shadier surroundings. Whilst his integrity is compromised due to his family being kidnapped, Adamat’s involvement is intriguing and he is a brilliantly balanced character. Tamas on the other hand is hard and unforgiving, especially in the eyes of his son, Taniel, an equally gifted Powder Mage. A soldier of repute, Taniel is tasked with a mission that ends up seeing him caught in the centre of the conflict both against the Kez but also with a set of powerful sorcerers and ancient magics. Whilst the plot is innovative and engaging, and the world building effortless, it is the cast of actors that really stand out. Tamas, Taniel and Adamat all have close allies each of whom are exceptional. But it is also the cast of villains, all pulling and plotting against each other and the book’s heroes. It’s such a vast and believable world that this was a true page turner for me. The writing and the story is fantastic whilst the ideas underpinning it all are brilliantly creative. McClellan is definitely another giant voice amongst the new breed of fantasy authors and I’m most definitely on board for the rest of this trilogy.